Kart racing games have been long dominated by the Mario Kart series, and with very few competitors. 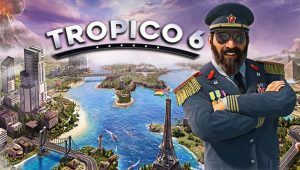 The established formula that that people are familiar with rarely deviates and is a fun game that almost anyone can enjoy. 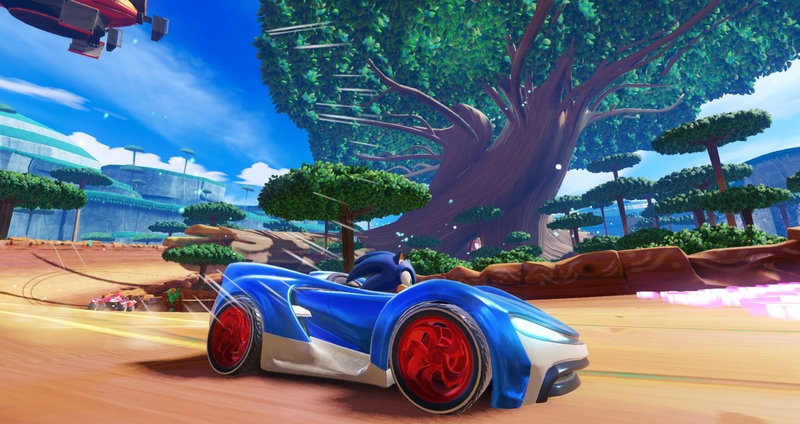 Team Sonic Racing, developed by Sumo Digital and published by Sega, is bringing new interesting mechanics in an attempt to add new life to the genre. Team Sonic consisting of the main three heroes from the game series – Sonic, Tails, and Knuckles, while Team shadow consisting of Shadow, Rogue and E-123 Omega. Each character had their own set of stats, and in the case of Sonic, he had the most speed of the team and ended up being my preferred selection during my time of play. 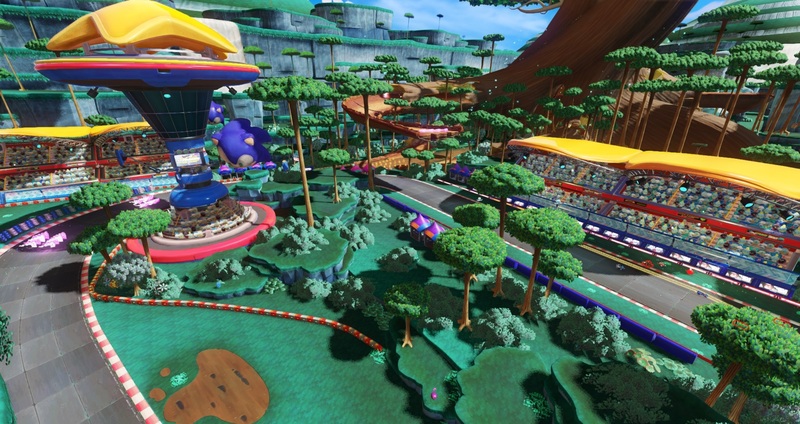 Visually, both the tracks and the characters follow in the traditional, brightly-colored Sonic the Hedgehog flair. The track available was vivid in color and detail, while the vehicles reflected the detailed lighting from the overhead sun nicely. 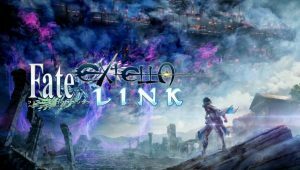 Accompanied by a lightning-fast framerate, the game felt very smooth and well executed. However, the crowd on the side of the starting parts of the track were blurry with flat animated sprites that did not fit in with the visuals that otherwise shined. 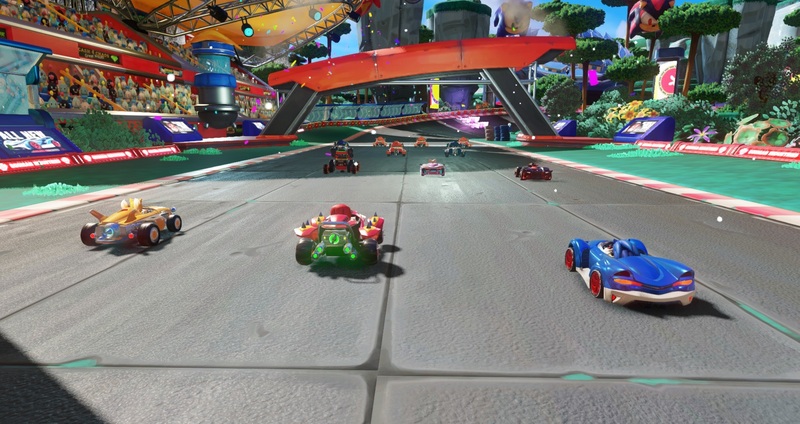 First and foremost, Team Sonic Racing is a Mario Kart clone at its core. Power-ups come in the usual flare. 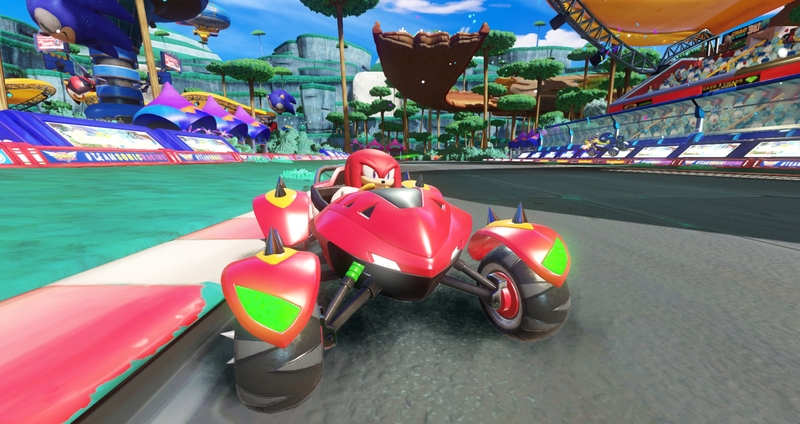 Some of them temporarily boost your speed, some attack other karts in front or behind you, some are comparable to bananas blocks and can be placed on the track in order to topple your opponents. Replacing Mario’s coins we have the traditional Sonic rings, which are naturally lost when you’re hit by an attack. 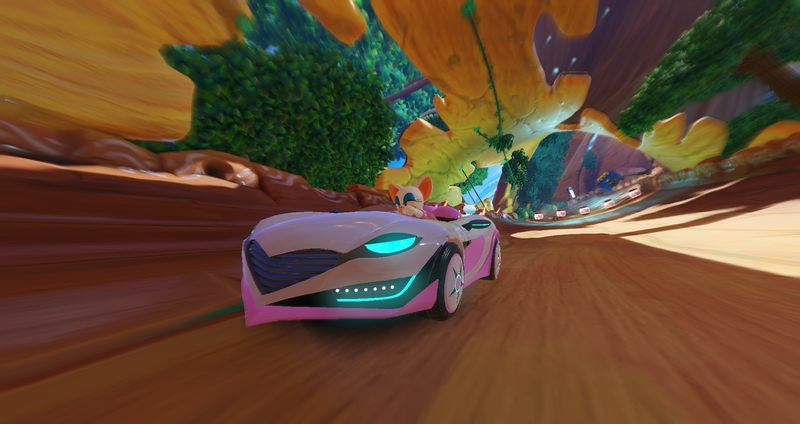 Drifting will give you a speed boost, and their are boosters set around the track – especially in one location where it simulated a familiar Sonic the Hedgehog vertical loop. 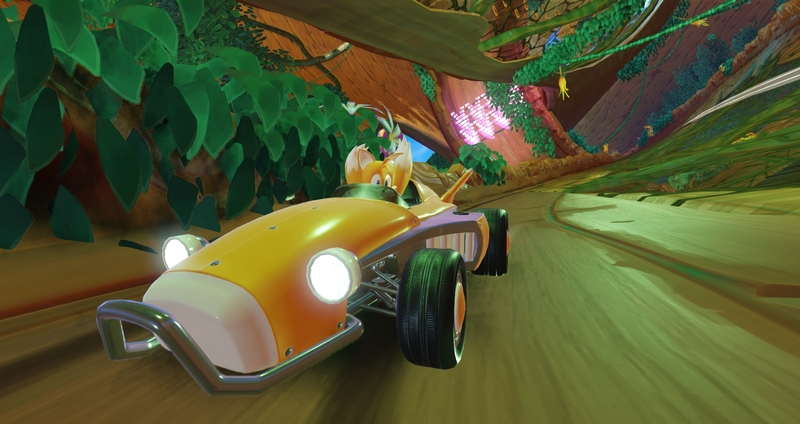 All aspects of the racing felt inspired from its rival series, only re-purposed into this game. 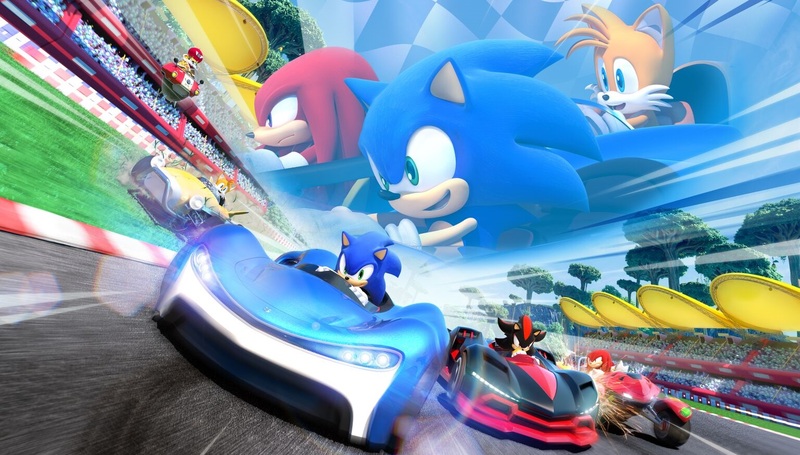 What Team Sonic Racing adds to the game provides a stronger sense of strategy. As the name suggests, Team Sonic Racing is based around team play. While racing three laps around the track you and your team can offer and exchange items between one another with a push of the button. What might not be ideal for you might help other members on your team. Each item has a use and much rather than using them wastefully, if it’s not something that fits your situation, you can transfer items with another character. Audio cues from vocal dialog kept alerting me to look at what was being offered, at the top of my screen. However, at some points the chatter got a little annoying and repetitive. During my time playing the game, the CPUs on my team as well my enemies were intelligent enough to provide a challenge. During my first round I started off in last place and had a good barrage of attacks against me that left me behind. However, both Tails and Knuckles offered me speed boost items throughout the match to help me catch up – eventually we overtook our competitors for the win. As an addition, each team has a meter to execute an ultimate ability. In this case it was reminiscent of the star power-up from Mario Kart, only it benefited my entire team. Interestingly, you are scored individually so getting first place does not guarantee win you the race. Your teams individual scores are all combined in order to determine your placement. Due to this, you want all members on your team to place as high as possible. Enforcing that this is a team game, one member lagging behind can ultimately cost you the entire race. With the assurance that online play with be included by the Sega developer on hand, gamers will need to cooperate with one another in order to secure a win. Team Sonic Racing was fun for the moments that I had with it but a lot still remains to be seen. 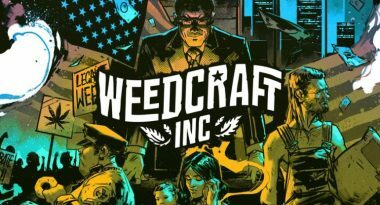 While is unfair to say if it has more to offer than Mario Kart, it is off to a good start. The team based mechanic has the potential to offer a lot of interesting ways to strategize with both the AI and with friends, and could shape up to be a solid experience. Team Sonic Racing is launching across Windows PC, PlayStation 4, Xbox One, and Switch sometime this winter.